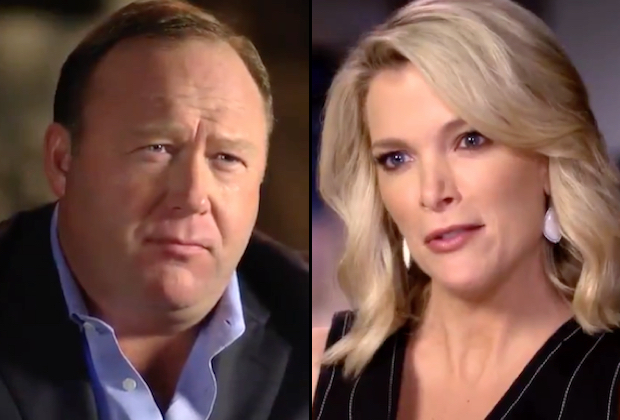 Former Fox News anchor Megyn Kelly is doing her best to establish herself as a hard-nosed journalist in recent interviews with Russian president Vladimir Putin and conspiracy peddler Alex Jones. Both shows were breathlessly hyped, and while Putin has spent decades conducting disinformation campaigns (and continues to do so; see my CSI Special Report “How Russian Conspiracies Taint Social Activist ‘News’”), Sunday night’s interview with Jones was the more controversial. This was due in part to Jones’s promotion of the conspiracy that the 2012 Sandy Hook school shooting in Newtown, Connecticut, was a hoax. The question of whether or not Kelly should have given Jones more of a platform for his blinkered views (or any legitimacy) is a fair one—and one she anticipated. In the program Kelly defended her decision at least partly on the grounds that Jones has some influence over the President of the United States. As I’ve noted in Skeptical Inquirer magazine and elsewhere (and in a PBS NewsHour segment), no modern politician has so successfully and routinely employed conspiracy theories as Donald Trump. Trump enjoys flirting with fringe and extremist elements including conspiracy theorists, and has appeared on Jones’s program. This is a legitimate concern, and Alex Jones, as the source of many of those conspiracies, is by extension useful to understand. That being said, the Kelly interview generated more heat than light (or ratings, as I’ll touch on). I watched the first ten minutes of the interview—it was about as much as I could stomach—and it was exactly what I expected. Jones blustered and bluffed his way through the interview, blithely brushing aside self-evident contradictions and routinely resorting to the familiar tactic of “I’m not saying any of this is true… I’m just asking questions!” What, if anything, Jones really believes remains an uninteresting mystery and it’s unlikely the program changed any minds. Yes, that’s right: More people watched a rerun of America’s Funniest Home Videos than Kelly’s much-hyped interview. So whether the interview helped or hurt Jones, it seems that few fewer people were interested in what Jones had to say than many people (and certainly NBC) thought. Which, overall, is a good thing—though it did raise the Sandy Hook issue all over again. For skeptics it’s often a no-win situation: If we ignore whatever bogus claim (UFO, Bigfoot, ghosts, conspiracies) then what happens is that believers say to themselves: “There must be something to it… I don’t see anyone refuting their claims or answering their questions!” People will often assume that if they are not hearing a solid rebuttal that it’s not because scientists and skeptics think it’s too silly or evidence-free to bother with, but instead that they can’t or won’t address the claims—or because scientists “fear the paranormal” as a threat to the materialist worldview. Ideally, the best way to treat these people would be to ignore them, but in practice that’s often counter-productive. As one of the most prominent skeptics to have written an article debunking part of the Newtown conspiracy, I have routinely been contacted by people about the topic since the event happened. Some are seemingly sincere, such as the man who asked me about claims regarding shooter Adam Lanza’s death certificate (see my column in the May/June 2013 issue of Skeptical Inquirer); several were hate mail and death threats; still others were conspiracy theorists who demanded the opportunity to “debate” me on the issue. In fact soon after the Kelly interviewed aired, I got an email from someone who wrote, “I am hoping that you can help me in my search for the truth about Sandy Hook. I as a school administrator are [sic] going a different direction that I believe you would follow. Please help me because it is all about helping children and parents not questioning whether they died or not.” The email ended with “Lots of videos on you tube [sic] about this issue,” which was a giant red flag for me that the source of this person’s information likely contained fact-free smatterings of all caps and no shortage of exclamation points. With all the diplomacy I could muster after only one cup of coffee, I politely declined his request to call him and debate the issue, after which I got a response refreshing in its clarity and brevity: “Coward and a Chickenshit.” As the saying goes, you can lead a horse to water but you can’t make it drink. Skeptics can do our best to offer critical analysis of extraordinary claims and evidence-based alternative explanations, but conspiracy thinking is powerful indeed.